Opening times Mon–Fri noon–11pm; Sat 12.30–11pm. 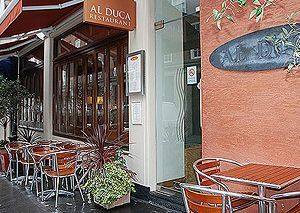 Al Duca, set in London's Piccadilly is approaching its tenth birthday. Opened in 1999 as part of the Pulze's 'Cuisine Collection' restaurant group, Al Duca's offers fine Italian food that has earned it a legion of loyal diners. The restaurant itself uses traditional Italian colours to evoke a warm and inviting feel; terracotta, olive and stone along with oak timber and mosaic tiling are used to great effect. The menu is suitably Italian, offering dishes such as tiger prawns with saffron vinaigrette, clam, garlic and chilli oil linguini and calf's liver with spinach, raisins and pine nuts. Three courses here cost an average of £40 per person which could be an offer you can't refuse!